The IC industry’s original system-on-chip (SoC) product category—microcontrollers—is expected to steadily reach record-high annual revenues through the second half of this decade despite an overall slowdown in unit growth during the next five years. Microcontroller sales barely increased in 2015, rising less than a half percent, to set a new record high of slightly more than $15.9 billion, thanks to a 15% increase in MCU shipments that lifted worldwide unit volumes to an all-time peak of 22.1 billion last year (Figure 1). Strong unit growth—driven by smartcard MCUs and 32-bit designs—enabled the MCU market to overcome a 13% drop in the average selling price (ASP) of microcontrollers to a record-low $0.72 in 2015. 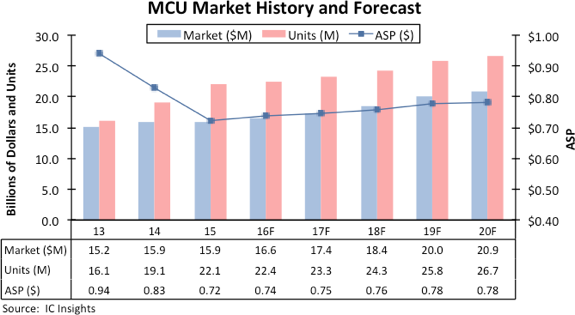 Price erosion—especially in 32-bit MCUs—has weighed down MCU sales growth in three of the last four years, but ASPs are now expected to stabilize and increase slightly in the 2015-2020 forecast period, rising by a CAGR of 1.6% compared to a -7.7% annual rate of decline between 2010 and 2015. While ASP erosion is expected to end, MCU unit shipments are forecast to rise at a much lower rate than in the first half of this decade, primarily because of a slowdown in the growth of smartcard microcontrollers and tighter reins on IC inventories for the “next big thing”—the Internet of Things (IoT). IC Insights’ forecasts MCU sales will rise in 2016 to nearly $16.6 billion, which is a 4% increase from $15.9 billion in 2015. MCU unit volumes are expected to grow by 2% in 2016 to 22.4 billion, and the ASP for total microcontrollers is forecast to rise 2% this year to $0.74. Between 2015 and 2020, microcontroller sales are projected to grow by a CAGR of 5.5% to nearly $20.9 billion in the final year of the forecast. Since the middle 1990s, worldwide MCU sales have grown by a CAGR of 2.9%. As shown in Figure 1, no downturns are anticipated in MCU sales through 2020. Total MCU revenue growth is expected to gradually strengthen between 2016 and 2019 (when sales are forecast to grow 9%) before easing back to a 4% increase in 2020. MCU unit shipments are now projected to grow by a CAGR of 3.9%. A major factor in slower MCU unit growth through 2020 is the maturing of the smartcard market, which in recent years has accounted for nearly half of microcontroller shipments and about 15-16% of total revenue. By 2020, smartcard MCUs are expected to represent 38% of total microcontroller unit shipments and about 12% of sales. Additional details and analysis on microcontrollers and other IC product segments are included in the 2016 edition of IC Insights’ flagship report, The McClean Report—A Complete Analysis and Forecast of the Integrated Circuit Industry. A subscription to The McClean Report includes free monthly updates from March through November (including a 250+ page Mid-Year Update), and free access to subscriber-only webinars throughout the year. An individual-user license to the 2016 edition of The McClean Report is priced at $3,890 and includes an Internet access password. A multi-user worldwide corporate license is available for $6,890.